This study sought to describe the pattern of complementary/alternative medicine (CAM) use among a group of patients with advanced breast cancer, to examine the main reasons for their CAM use, to identify patient's information sources and their communication pattern with their physicians. Face-to-face structured interviews of patients with advanced-stage breast cancer at a comprehensive oncology center. Seventy three percent of patients used CAM; relaxation/meditative techniques and herbal medicine were the most common. The most commonly cited primary reason for CAM use was to boost the immune system, the second, to treat cancer; however these reasons varied depending on specific CAM therapy. Friends or family members and mass media were common primary information source's about CAM. A high proportion of advanced-stage breast cancer patients used CAM. Discussion with doctors was high for ingested products. Mass media was a prominent source of patient information. Credible sources of CAM information for patients and physicians are needed. The use of complementary and alternative therapies is increasing, especially among patients with life-threatening diseases such as AIDS and cancer, and traditionally defined vulnerable populations, such as the elderly. [1–5] Prior studies have estimated that the proportion of cancer patients using CAM varied from 7 to 64%, , with higher figures among breast cancer patients, ranging from 67% to 83%. [7, 8] Postal or telephone surveys of large groups have helped establish the rate of use of CAM therapies, but such methods give limited information about the specific use pattern for any given patient, nor do they commonly collect information on why specific CAM modalities were chosen, or where the patient obtained the information on particular CAM use. The objectives of this study were to conduct structured face-to-face interviews with advanced stage breast cancer patients in order to describe their patterns of use of CAM therapies and products, to understand their reasons for selecting specific CAM therapy or product, and to identify their information sources on the use of CAM therapies and products. Consecutive patients with advanced-stage breast cancer who were candidates for stem cell transplant at a comprehensive oncology center breast cancer program were recruited. This study provides important insights into CAM use among a group of patients with advanced disease, who may be both more willing to "try anything" given their poor prognosis and more likely for potential adverse interactions between conventional therapy and CAM therapies. The study was conducted at a tertiary teaching hospital with a comprehensive cancer center. The institutional review board approved the study. Patients 18 to 62 years of age were eligible for this study if they had histologically proven resected breast cancer, Karnofsky performance status greater than 80 (on 0–100 scale), life expectancy of at least 6 months, and were appropriate candidates for the breast cancer stem cell transplant program. Subjects who had brain metastases, life threatening concurrent nonmalignant conditions, or any condition that compromised their ability to give informed consent were excluded. Consecutive patients attending oncology clinics between March 1997 and January 1998 were enrolled after informed consent was obtained. All patients signed an informed consent approved by the institutional Review Board. The structured interviews were conducted prior to their participation in a breast cancer stem cell transplant program, which at the time the study was carried out was a treatment being applied in the setting of high risk breast cancer for which other therapies were not highly effective. Patients were able to decline participation for any particular question at any point during the interview. The information was kept confidential. No patient was paid to participate in the study. Subjects were assured that refusal to participate in the study would not affect their future care in any way. Two trained research assistants conducted the face-to-face interviews. Before the questions were selected, a focus group (n = 6) was held to explore how women with advanced stage breast cancer perceived CAM therapies and their use of CAM, as well as how they obtained information relating to CAM services and products. Findings from this focus group and measures cited from the literature were used to construct a questionnaire. The questionnaire was developed and revised over a ten-week course. Two pilot tests for use with breast cancer patients (n = 12) were conducted during this period. Two interviewers who were experienced in interviewing cancer patients were trained in conducting the face-to-face interview and administered all the interviews in the study. The questionnaire included a list of CAM practices, therapies, and products: relaxation techniques (including tai chi, yoga, or chi gong and other meditative techniques); chiropractic manipulation; massage; imagery (or visualization); energy healing (including therapeutic touch); biofeedback; hypnosis; spiritual healing practices; herbal medicine; special diets and supplements (e.g. macrobiotic diets); megavitamin therapy, minerals, shark cartilage; homeopathy; acupuncture; folk remedies; "underground" or illicit drugs. If a patient respondent used any of the services or products during the six months prior to the interview, then the interviewer would ask: the reasons for using the particular CAM; when the use began and ended; what the primary source of information was; and whether an individual discussed the use of the particular CAM with her regular physicians. Each individual was also asked about her self-perceived knowledge about CAM ("Compared with most people, how well informed would you say you are about CAM?") Demographic information including age, education, ethnicity, marital status, dependence and support, and household income category were also obtained. Study participants were classified as either CAM users or CAM nonusers according to whether or not they used at least one CAM therapy in the past 6 months. Demographic variables included age, education, ethnicity, marital status, and household income. Information on time of diagnosis, stage of disease, and previous cancer treatments received were abstracted from medical record. Differences between CAM users and nonusers with respect to participant characteristics were assessed by χ2 tests or Fisher's exact tests for discrete variables, and Wilcoxon rank sum test for continuous variables. Logistic regression analysis was also conducted to examine the characteristics contributing to CAM user or nonuser. All P value tests were two-sided. Since individual patients may use multiple CAM therapies, we estimated the frequency distribution of the main reason for overall CAM use by averaging individual estimates of this frequency (i.e., we estimated the frequency distribution on each individual over a potentially mixed set of modalities and averaged these frequencies over individuals). In this way, all individuals, without regard to the number of CAM modalities they used, were weighted equally in the analysis. In a similar way, we estimated the frequency distribution of the main source of information on CAM with each individual given equal weight in the analysis. One hundred and fifteen consecutive patients were interviewed and completed the face-to-face structured interviews without refusal. (They included 111 consecutive patients who were about to undergo stem cell transplant program and 4 patients who recently completed the program.) Among them, 84 patients were users of CAM therapies (73% of the study participants, C.I. 65% to 81%). Overall, the mean age of all patients was 45.9 years (median 46, range, 27 to 63 years). About two-thirds of the patients reported their ethnicity as white, the remainder of the patients belonged to a wide range of ethnic groups. Most had a college education, with an average of 15.2 years of completed education. Most had received surgery, radiation, and all subjects had previously received chemotherapy for treatment of cancer. The majority of patients were married. Comparing the characteristics between users and nonusers of CAM: (Table 1) Users of CAM had more years of education when compared to nonusers (P < .001, Wilcoxon ranksum test). Users and nonusers did not differ significantly according to age, income, marital status, and family support. After adjusting for covariates in the multiple logistic regression analysis, which included age, education, income, marital status, and family support, years of education still remained a predictor for use of CAM (P < .001). Discrete characteristics were compared by Chi square test or Fisher's exact tests. Continuous characteristics were compared by Wilcoxon rank sum test. CAM users perceived themselves to be better informed about CAM than CAM nonusers. Patients were asked: "Compared with most people, how well informed would you say you are (about CAM)." They were ranked on a 1–5 Lickert scale, with 1 = Much better informed than most and 5 = Much less well informed than most. The CAM nonusers group had an average of 3.2 (median 3; 3 = About as well informed as most), the CAM users group had an average of 2.3 (median 2; 2 = Somewhat better informed than most). (P < .001, Wilcoxon ranksum test). Seventy three percent of the interviewed patients reported using at least one category of CAM in the previous 6 months. Among the CAM users, people often used more than one CAM modality or products in combination (range 1–9 categories, mean 3.9, median 4). 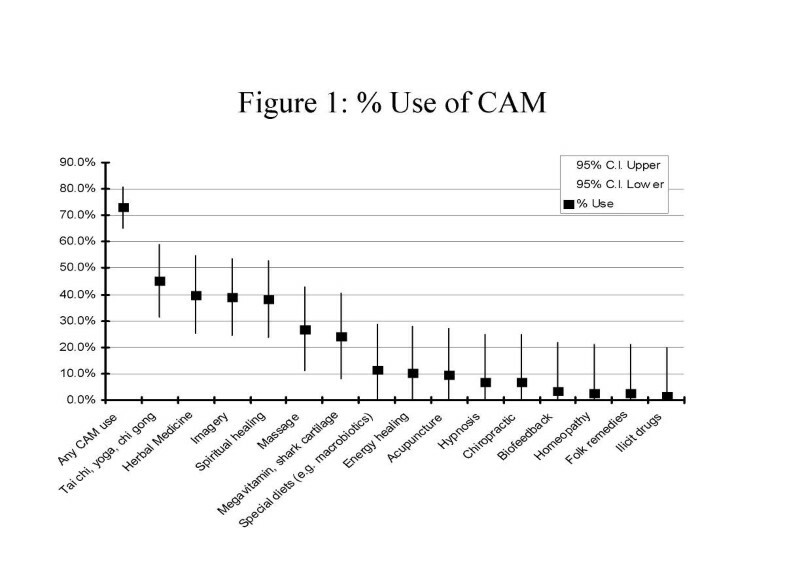 Figure 1 shows estimates of the percent use for various categories of CAM therapies and products. The vast majority of CAM users consumed CAM products. The frequency and duration of use of CAM products varied greatly, ranged from regular daily consumption to sporadic use. The most commonly used CAM product was "herbal medicine" category used by more than half of all CAM users (and by 40% of all study participants, C.I. 25% to 55%). Patients had a variety of sources to obtain their herbal medicine: by mail order, in stores, from their chiropractors, acupuncturists, and from friends and family members. When asked whether their use of the CAM was used in any integrative program or under professional supervision, the majority of herbal medicine users (59%) reported that they were not under the supervision of their physicians nor herbalists. A minority of patients visited CAM practitioners. Overall, less than one third of the CAM users visited CAM practitioners. Among users who visited at least one CAM practitioner, the patterns of care they received from CAM practitioners also varied greatly, ranging from a single isolated visit to ongoing regular weekly visits. Patients may have more than one reason to use a particular CAM therapy. When a patient reported a particular CAM use, she was asked to provide a primary reason for the particular CAM therapy use. The primary reason for use varied according to CAM modality. Among patients who practiced tai chi, yoga, chi gong or other relaxation and meditation techniques, the two most frequently given primary reasons given were to reduce stress and to boost the immune system. Among patients who took herbal medicine, the most commonly reported primary reason was to cure cancer, followed by to boost the immune system. Forty percent of all the reasons given for using all CAM products was to boost the immune system. The second most common reason was to treat cancer (32%). The third most common reason was to relieve symptoms and stress associated with side effects of conventional treatments, such as surgery, radiation, and chemotherapy (21%). Other primary reasons cited included stress reduction and detoxification. Patients may have obtained information about a particular CAM use from multiple sources. When a patient reported a particular CAM therapy use, she was asked to provide the one primary information source about that particular CAM therapy. The primary information source on CAM therapy use varied according to CAM modality. Among patients who practiced tai chi, yoga, or chi gong or other relaxation and meditation techniques, the two most common primary information sources were mass media (including TV, newspaper, magazine, video tapes, the Internet, and other mass media) and friends or family members. Among patients who took herbal medicine, the two most common primary information sources were also mass media and friends or family members. An overall estimate of the frequency distribution for the most common primary information sources (without regard to CAM modality) demonstrated that the two most common primary information sources were friends or family members (31%) and mass media (32%). Less common primary information sources were health professionals in conventional settings (16%, these included nurses, nutritionists, physicians, pharmacists, social workers, and other health care workers) and CAM practitioners (17%, these included chiropractors, acupuncturists, herbalists, message therapists, and other CAM workers). 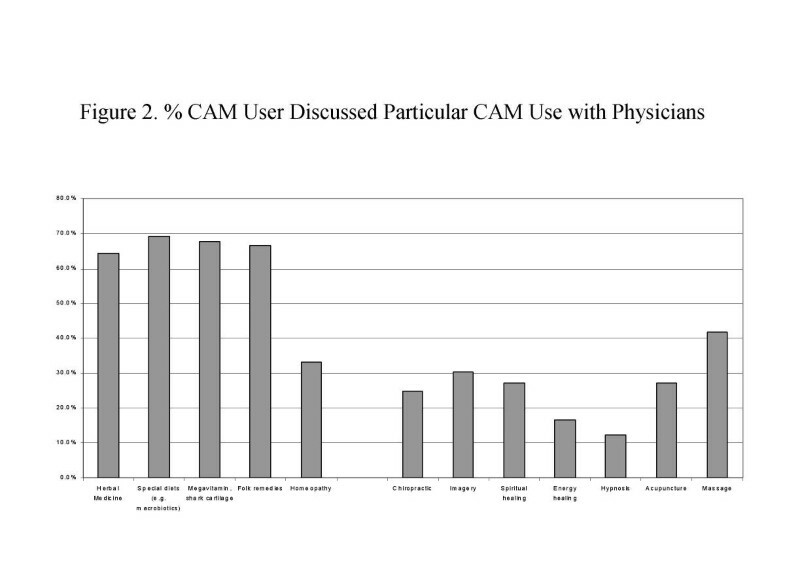 Figure 2 shows the percentage of patients who discussed their CAM therapy by specific CAM modality. We found that a high proportion of patients discussed their CAM use with their physicians when they used herbal medicine or other products they ingest (the exception was homeopathy). Patients were less likely to discuss their CAM use with their physicians when CAM use did not involve ingested products, such as chiropractic manipulation, imagery, spiritual healing, energy healing, hypnosis, and acupuncture. Our study provides both some measure of reassurance and raises concern about the use of CAM by patients with advanced-stage breast cancer. First, we found that the vast majority (73%) of our patients use CAM, a finding in line with previous estimates [7, 8]. Unlike previous studies [10–12], we found that most patients using ingested CAM products (herbs, special diets, supplements, and folk remedies) discussed this use with their medical providers. Making their physicians aware of the use of ingested CAM products is a necessary first step toward preventing unwanted interactions with the multiple conventional medications and care these patients also undertake [13–15]. By telling the doctors one might speculate that the patients wanted guidance from physicians to avoid potentially harmful treatments and toxic interactions. This illustrates the importance and need for physicians to know about the toxicity and interactions and the evidence for various ingested CAM products. Such information is scarce thus well-designed clinical trails of these therapies are needed. The CAM modalities these patients discussed less frequently with their physicians (yoga, meditation, imagery, spiritual healing) seem unlikely to cause unwanted interactions with concurrent care. Perhaps that is the reason that patients disclose them less frequently. Another explanation is that many physicians do not lend credence to many of these CAM modalities, thus patients might be reluctant to discuss them. Credible information on efficacy is also lacking this area. It is unclear whether the above selective communication pattern is unique to a highly educated patient group with advanced cancer, or common to other patient populations. It is also unclear whether physicians in general are prepared and equipped with needed information to consult their patients on the CAM use. Future research will inform us about these areas. The concern our study raises is the important role that mass media plays as a source of patient information about CAM therapies. Studies of direct to consumer advertising of conventional pharmaceuticals have shown that such information may be less than accurate and unbiased [16–19]. The possibility that CAM therapies are being marketed unscrupulously to persons desperate to try anything has to be considered and should be the subject of further study. This is particularly pressing as there are to our knowledge, no convincing data that any of these CAM products are effective for two of the most common primary reasons these patients gave for using CAM, namely, "to boost the immune system" and "to cure cancer" [20, 21]. However, even if CAM use does not cure cancer or boost the immune system, CAM use may have other health benefits in addition to the primary stated reason of relieving symptoms and reducing stress, such as increasing quality of life through a feeling of control and empowerment. These are additional areas for fruitful research. Our study's primary limitation is that we studied patients with a single type of cancer at a single institution. This restriction, however, afforded the opportunity to use face-to-face interviews to delve more deeply into understanding CAM use than would have been possible in a national survey. Further research will be required involving patients with other types of advanced cancer or who get care in other settings. In conclusion, we found that the great majority of women with advanced breast cancer used CAM therapy and most patients using ingested CAM therapies discussed their use with their medical doctors. Mass media plays a large role as a source of patient information. The importance of unbiased information available to both patients and physicians is emphasized by this study. JS and JG designed the study, secured funding, recruited patients and staff support. NW, PS and JG supervised the execution of the study. RA, PA, JS and MC analyzed the data. All authors contributed the manuscript preparation and approved of the final paper. This study was funded in part by grant #41897 to Dr. Shen from the American Cancer Society, California Division Inc. The authors thank Linda Norton and Ellen Karpf for patient recruitment; Ulyanna Choong, Jane Paredo, Tod Sasaki, Kim Moon for research assistance; William Harlan, M.D., for reviewing the manuscript and providing helpful comments. Dr. Shen acknowledges National Institutes of Health-Office of Directors, National Center for Complementary and Alternative Medicine, and National Institute on Alcohol Abuse and Alcoholism, for their current intramural support. Dr. Shekelle was a Senior Research Associate of the VA Health Services Research and Development Service.